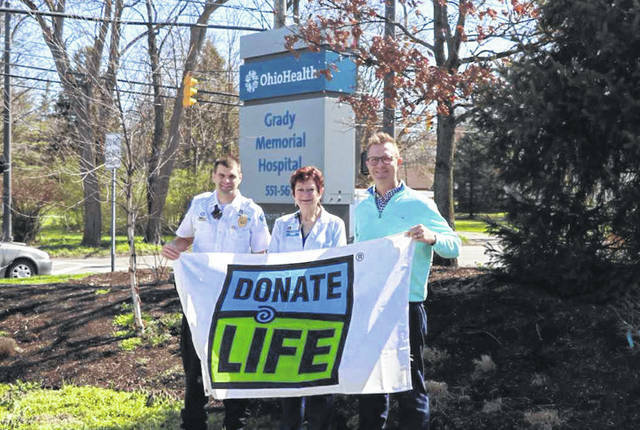 Pictured holding a Donate Life flag outside OhioHealth Grady Memorial Hospital in Delaware are, left to right, George Organ, protective services supervisor at Grady; Denise Anderson, nurse administrator at Grady; and Andrew Mullins, director of Partner Services at Lifeline of Ohio. Those words were engrained into George Organ’s mind from his father years ago. Organ, now a supervisor with protective services at OhioHealth Grady Memorial Hospital, said his dad was always someone who would do what he could to help; a man who would do what he could to give to others. In 2010, Organ’s father died of a massive heart attack. “We were in shock,” Organ said. After grieving as a family in those first few hours, the Organ family met a representative from Lifeline of Ohio. Organ’s father was a registered organ donor who was going to give to others, one last time. “Of course, my dad was an organ donor. It was on his driver’s license. We knew it as a family,” Organ said. April is National Donate Life Month. The gift Organ’s father gave, the gift of life, is now being given more and more around the state and here in central Ohio. Lifeline of Ohio has worked hand-in-hand with OhioHealth hospitals for years, including Grady Memorial Hospital. Denise Anderson is a nurse administrator at Grady Memorial and has been the liaison between the hospital and Lifeline of Ohio for five years. After a donation, sometimes donor families and recipients write one another to see where the donations go and who they help. Organ’s father helped 51 people. His family received two letters from grateful recipients. “That was huge as far as the grieving process, hearing back from families,” Organ said. In one letter, a family told them Organ’s father helped one man live two more weeks. That might not sound like much, but to Organ, it meant everything. Mullins says all correspondence from donor families and recipients goes through Lifeline of Ohio and remains confidential until the parties both agree to exchange contact information. But whether there is contact or not, these gifts of life can have a ripple effect for generations. Each day in April, and when a donation happens throughout the year, Organ raises the Donate Life flag outside of Grady Memorial Hospital. That gesture means so much to him and his family. “Each time I do it, I think of my dad. I think of those people he helped and how they are doing now. It’s very personal to me,” Organ said. Nationally, 115,000 people are waiting for an organ transplant. That number is 3,000 in Ohio and 600 in central Ohio. To become an organ donor, visit lifelineofohio.org. Individuals can also sign up at their local Bureau of Motor Vehicle offices.